As I compiled this list of Disney movies, many of the categories required me to do my homework: re-watch films I hadn't seen in ages and even see a few I'd never seen before and knew only by reputation. It's been fun to do side-by-side comparisons and see how these great movies have held up over time. A few categories needed no research at all, because the choices were so obvious. Disney's best love story is one of them. It's the "tale as old as time" and the finest feature film of Disney's third "golden age" of animation. 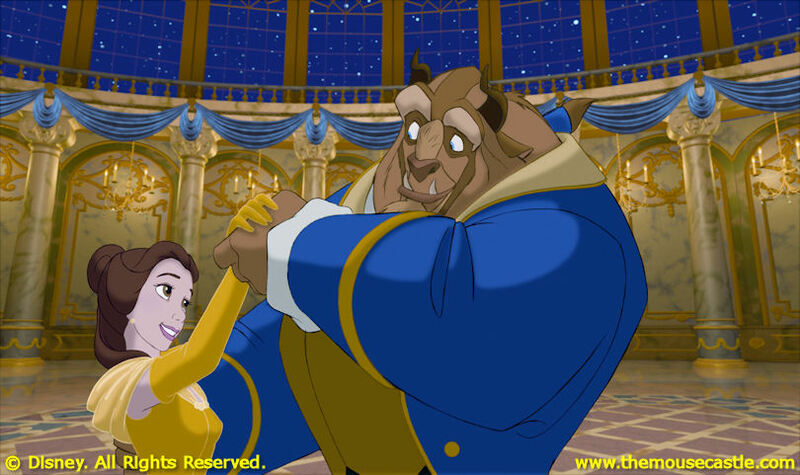 The movie often gets categorized as just another Disney princess film (particularly for Disney merchandising purposes), but it's important to understand how much Beauty and the Beast breaks the mold of the typical fairy tale story. Our heroine, Belle (Paige O'Hara), isn't some waifish ingenue waiting for her prince to come. Quite the contrary. She's intelligent, literate and responsible, looking after her eccentric inventor father, Maurice (Rex Everhart), and fending off the advances of the ruggedly handsome, but exceedingly vain and arrogant, Gaston (Richard White). Belle is also incredibly beautiful, but probably doesn't realize it. She's too busy losing herself in books and pondering what adventures await in the outside world. This isn't normal for the residents of the provincial French village where she lives. They happily follow their same routines day after day--and think Belle is a bit odd. When Maurice loses his way in the woods and is held captive inside a remote castle lorded over by a monstrous beast, Belle selflessly offers to take his place. In doing so, she sets the stage for one of the greatest romances in movie--let alone Disney--history. The beast of the castle was once a selfish young prince, now cursed by an enchantress as punishment for his cold-hearted ways. He will remain a monster until someone can see through his ugliness and fall in love with him. But, this must happen before a magical rose, kept under glass inside the castle, loses its petals. If the last petal drops without true love being found, the prince will remain a beast forever. Also under the spell of the enchantress are the beast's house servants, who have been turned into all manner of household objects. 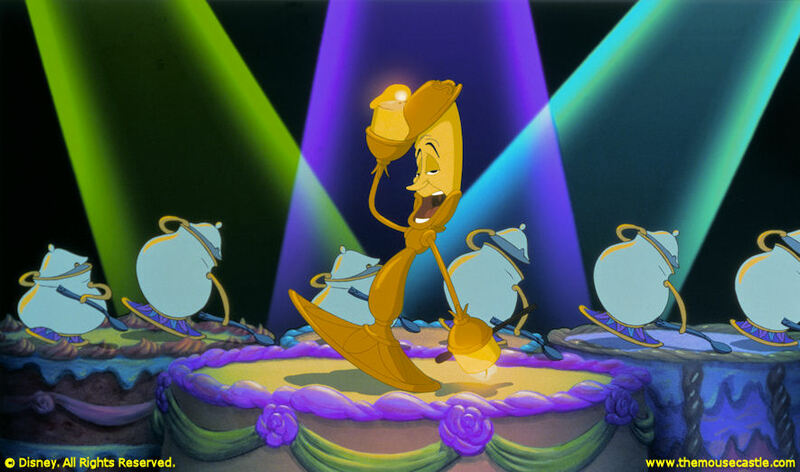 They include the butler/candelabra Lumiere (Jerry Orbach), the head-of-staff/clock Cogsworth (David Ogden Stiers) and the kitchen maid/teapot Mrs. Potts (Angela Lansbury). All see the presence of Belle in the castle--even under these dire circumstances--as an opportunity for the spell to be broken, so they set about to make her as welcome as they can and try to push her and the beast together. They know there is good in their master that belies his appearance and actions. He just needs the right person to bring it out. Beauty and the Beast tells its story using a classic musical theater structure (small wonder it would become the first Disney feature adapted to the Broadway stage). The opening number, "Belle", is fun and energetic as it introduces us to the main characters of the village. In a matter of minutes, we learn everything we need to know about them (Belle is a "funny girl," Gaston is a pompous jerk). All the songs, penned by composer Alan Menken and lyricist Howard Ashman, are memorable, from the endearing title tune to the exhilarating production number "Be Our Guest." Both audiences and critics responded enthusiastically to Beauty and the Beast. It was nominated for four Oscars, including Best Picture, the first animated feature film ever to be so honored. In an era when Best Picture nominations were limited to five films (instead of the current ten) and when there was no Best Animated Film consolation prize, this was an amazing achievement and a testament to the timeless quality of the film. Beauty and the Beast (along with its predecessor The Little Mermaid), was Disney's triumphant return to quality feature animation after a fallow period of more than 25 years. With beautiful animation, classic tunes and a love story for the ages, it ranks as one of Disney's all-time bests. The 30-Day (or so) Movie Challenge continues tomorrow with the best Disney chick flick. No, really.